HOMEGROWN acts Vance Joy and The Living End will feature as part of this year's AFL Grand Final entertainment at the MCG. The Melbourne artists will perform during the pre-game show and in a free concert for fans at the post-match premiership party. League chief executive Gillon McLachlan announced the acts on Wednesday via the AFL's Twitter account in a live Q&A with fans. 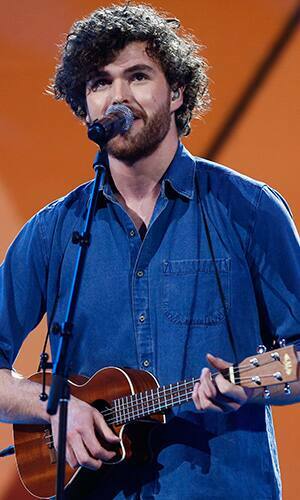 McLachlan was joined in the Twitter 'Blue Room' by Vance Joy (real name James Keogh) whose hit song Riptide is the longest-standing single in the top 100 of the ARIA Singles Chart's history. "I’ve been watching the AFL Grand Final for as long as I can remember, it’s an absolute honour and dream to be able to perform at the game on October 1," said Vance Joy, who got his start playing open mics around his hometown in Melbourne. Aussie rockers The Living End have been one of the country's best-known bands since they burst onto the scene with single Prisoner of Society in the late 1990s. Other hits include All Torn Down and White Noise. Since forming at high school and busking the streets of Melbourne, The Living End has gone to number one, had four platinum plus albums, been awarded APRA’s Australian Song of the Year and scored six ARIA awards. "The Living End have always been proud to call ourselves a Melbourne band and we all grew up loving football and rock'n'roll, so to have the chance to rock the 'G on Grand Final day is a career highlight," lead singer Chris Cheney said. "There are few gigs rarer and more prestigious than playing at the AFL Grand Final. "It's a once in a lifetime opportunity and we couldn't be more honoured and excited to be a part of footy’s biggest day of the year." After launching the finals on Wednesday morning, McLachlan said Vance Joy and The Living End would appeal to a range of football fans. "It is a pleasure to announce two homegrown acts, both of whom have breathed football for the entirety of their lives, to perform during the Virgin Australia Pre-Game Show and Premiership Party on Toyota AFL Grand Final Day," he said. "The entertainment acts have been chosen to appeal to a wide cross-section of football fans but also to others who love great Australian music. "Fans who miss out on the opportunity to witness the Toyota AFL Grand Final live, will have the opportunity to come into the MCG following the match for a free concert, the Virgin Australia Premiership Party, headlined by Vance Joy and The Living End." Fans who don't have tickets to the Grand Final can enter the MCG from 6pm post-game to join the premiership party. Further announcements, including the identity of the Australian national anthem singer, will be released in the lead-up to the Grand Final.